Blockchain technology has many appliances in numerous fields, and it seems that the freelance market has also started taking notice of its uses. By cutting out the middleman, this will change how people overall do their work as well as improve the flexibility of their working program. Ethlance is a platform that is similar in concept to what Freelancer.com or Upwork.com do, but without the fees. Its zero-fee marketplace runs on the Ethereum blockchain, the distribution of its front-end files being handled by IPFS, the decentralized web protocol. It operates on a trustless system and as a result, no fees are required. Ethlance is an upcoming straup in the freelance market meaning that the competition is currently at low levels giving freelancers a better chance of finding projects compared to Freelancer or Upwork where the network is oversaturated. By being built on the Ethereum blockchain Ethlance is able to execute smart contract functionalities through which employers can pay their freelancers, without charging any types of fees for the platform. “We take no cut from transactions between freelancers and employers and also, there are no fees for membership. This will never change. That’s something a centralized approach with fiat money can never afford to do on a large scale.”-said Matus Lestan, Ethlance developer. Only the “gas fees” which the Ethereum network requires for transaction processing is taken from the payments. These are considerably lower compared to the fees charged by traditional freelance marketplaces, which can amount up to 20 percent of the freelancer’s payment. Freelancers are able to look for jobs by typing the services available in the search bar, and the search can be further narrowed down by selecting the employer’s rating, the type of payment offered, experience level, the length of the project, budget, and availability. Currently, Ethlance does not offer the option to make full-text searches, but jobs entries can be sorted according to 4,700 predefined skills that appear in a drop-down menu after a skill is typed into the search bar. Employers instead can look for freelancers to hire based on the skills, rating, hourly rates, country, language, and feedback they have on their profiles. To join Ethlance’s platform, the installation of one of two Ethereum tools is necessary in order for users to access its services. The extensions that have to be installed are either MetaMask or Ethereum’s Mist browser. 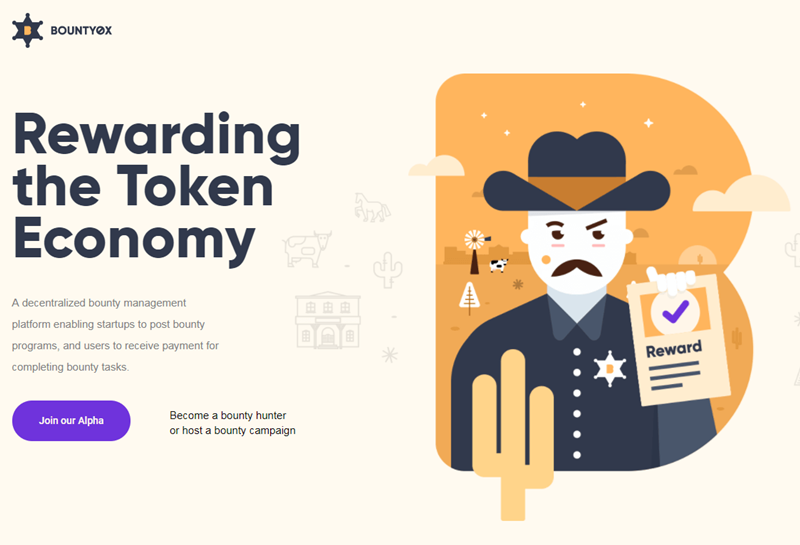 Bounty0x is a decentralized bounty hunting network which employs a review system based on staking and burning tokens. By making use of blockchain technology, Bounty0x offers solutions for online marketing, consulting, software development, as well as research. The platform will enable developers to efficiently detect the bugs in their code by posting reviews and paying when the errors have actually been identified. Bounty0x can also impact the consulting industry by making the latest industry trends available through expert training on a global level. As a result, the industry will become decentralized, making it more available to all interested individuals. In addition to bounties, users are also able to make reviews on the completed tasks, manage all their payments, offer individual assistance when required, and gain more exposure to a wider advertising and marketing public. The freelance market has many platforms built for this specific purpose, but Bounty0x is the first one developed with bounty management in mind. Bounties come in 3 types: simple bounties- which are verified automatically by algorithms and API’s, Sheriff bounties- which enable Sheriffs to earn tokens for making correct verifications, and last but not least, Super bounties-which need approval form the project admin, which is reserved for highly technical bounties. Bounty0x’s token, BTNY will be used by the platform as payment for carrying out bounty tasks for ICO startups. Blocklancer is a blockchain-based platform which aims to create a distributed autonomous job market created on top of the Ethereum blockchain. Blocklancer boldly claims that its platform will solve “all problems of current freelancer platforms”. It guarantees that all payments will be settled through an automatic dispute system, ensuring fairness. It also advertises low fees and zero censorship. Unlike other freelance platforms that charge a fee of 20%, Blocklancer only requires a fee of 3% from its freelancer. This project will handle the many issues that currently plague the freelancing world, including but not such as fake reviews, unfair and late payments, lack of schedule flexibility and having to be at the complete control of a central authority. Blocklancer isn’t owned by any centralized company, instead, the power goes to its token holders. The token holders do not need to rely on a single authority to settle disputes, and instead uses the token holder tribunals (THTs), a decision system that depends solely on its token holders. This system not only guarantees them fairness but also the possibility to earn their fees. This means that there will not be any unilateral decisions taken by a partial authority and no party will lose their money in an unfair trial. This distributed autonomous job market will self-regulate itself and offer a secure and efficient medium through which employers and freelancers can contact each other. Freelancers will be able to easily search for jobs on the platform and build their freelancing reputation, which will let them get contacted by clients that look for their skills. Employers, on the other hand, post their job offers on the Blocklancer platform and wait for interested freelancers to apply for them. Employers also have the option to contact trustworthy freelancers directly. As an employer, you can make the payment only when you are completely satisfied with the work provided, or if project milestones are completed.